Molly McAdams knows how to deliver a compelling read from beginning to end and her latest novella, Changing Everything, is no exception. We first met Eli Jenkins in Forgiving Lies as Rachel and Candice's brother. Changing Everything follows the same timeline, and we see the hospital scene with Rachel and Kash from Eli's perspective. However, Changing Everything makes a very good stand-alone for those who are new to the series. Eli and Paisley Morro have been best friends since they were thirteen. But Paisley has always seen Eli as more then a friend, she has been in love with him since the day she met him. Unfortunately, Eli is clueless to Paisley's feelings and often uses her to fend off his previous one-night-stands, ripping away pieces of her heart in the process. When Eli is faced with the possibility of loosing Paisley forever he realizes that he has loved her forever, loosing her would be like losing a piece of his soul. Is Eli's realization too little, too late though? 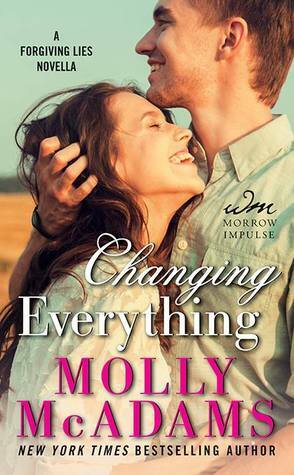 Changing Everything is a wonderful addition to the friends turned lovers trope and Molly McAdams delivers another heartfelt story to add to your collection. Molly's writing is gripping, dragging you right into the story alongside the characters. However, there was considerable less angst and emotional turmoil then what I have come to expect from this author. With the novella length of this title, that worked though. Readers still receive McAdam's classic spin on love triangles that I don't think any of her books can go without, no matter how frustrating! lol With Paisley and Eli, you have two characters that you know are perfect for each other but of course it takes the male lead a few little nudges to realize that. The ending was wrapped up a little too neatly for my taste but all in all, Changing Everything was a short and sweet story. As always, I look forward to more books from this hugely talented author!